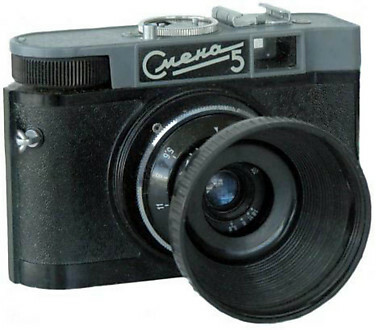 In 1962 Smena producer GOMZ became LOOMP („Leningradskoje objedinenije optiko-mehanicheskich predprijatij“). Need to mention, that LOOMP name as rule wasn‘ t used for camera markings and such cameras with LOOMP markings are quite rare. Only in 1965 Smena producer received permanent and very well-known name „LOMO“ (Leningradskoje optiko-mechanicheskoje objedinenije). 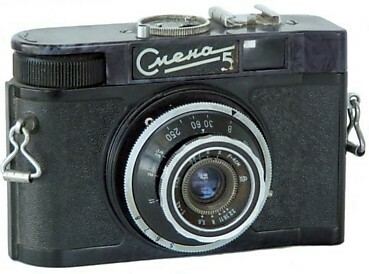 Smena-5 camera designed to use thermoplastic instead of bakelite. Lens T-42 with GOMZ logo, serial number under shutter housing. Strap lugs on body. Sunshade reverses on lens to provide protection. Very seldom to meet camera. Shutter: 1/30, 1/60, 1/125, 1/250 + B. Original price (in year 1961) 9 roubles. PK2305. 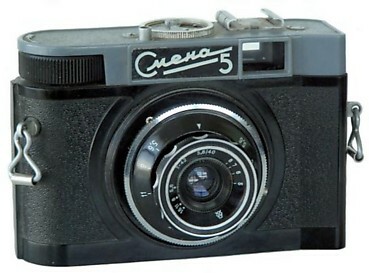 An earliest so far known version of Smena-5 camera. The body has smaller dimensions (!). Top plate is speckled and close to black, with no decorative rim at the body margins. The surface of bottom plate is totally plain, without any border risings. Shutter speeds are written on shutter faceplate (1/125s is not mentioned at all). Lens parameters still old style 1:5.6 F-4 cm. Different design of rear door lock. The GOMZ logo on the rear door is bigger size. There are some differencies inside the camera either . Aperture numbers on lens: f/5.6 - f/22. PK2310. 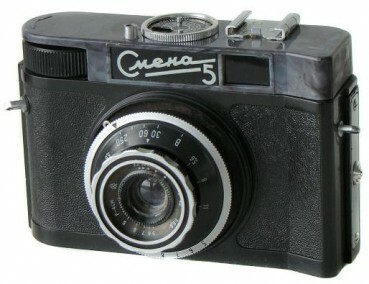 Camera identical to PK2305, but painted in "metal like" imitation. An additional screw on the top plate already. No otherwise different. An earliest so far known camera has s/n #001775 (A.Nikitin coll.). PK2315. 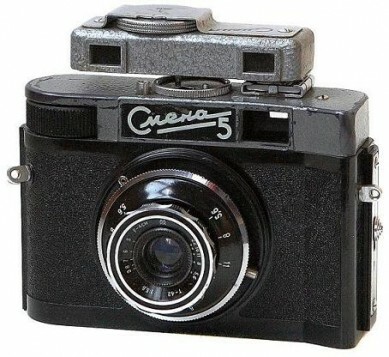 Seems to be the latest type of early Smena-5 camera. Identical to PK2310, but with speckled top plate again. The same additional screw on the top plate. The body still smaller dimensions. The surface of bottom plate is totally plain, without any border risings. Aperture numbers on lens: f/5.6 - f/22. PK2320. 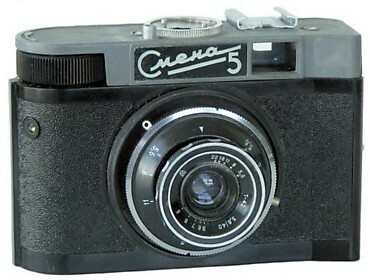 Seems to be an earliest version of the regular Smena-5 camera. Bigger body dimensions due to body risings on the bottom plate. Speckled top plate without decorative markings at the body margins.An earliest so far known camera has s/n #015622 (Molotok, 2009). PK2325. "Metal like" imitation top plate paintings. New design of shutter and lens - shutter speeds engraved on the shutter housing already. The same aperture numbers f/5.6 - f/22. An earliest so far known camera has s/n #011210 (A.Zilbert coll.). Thanks to Alexey Nikitin for camera #023157 donation! PK2330. Camera identical to PK2325, but with speckled top plate again. An earliest so far known camera has s/n #029502 (A.Nikitin coll.). PK2335. Decorative rim on camera's top plate already. This less to find outlined by wide decorative rim (see picture opposite. Different aperture numbers on lens: f/5.6 - f/16. PK2340. Camera identical to PK2335, but without wide decorative rim around the shutter already. My camera #076909 (see the 1st picture on the top) comes in complete set with paper box, camera manual, passport and protectional sunshade. PK2350. Camera visually identical to PK2335, but with two exceptions: (1) the maximal aperture number is f/22 again and (2) 1/125s shutter speed is not marked on shutter plate. PK2355. Very uncommon version to find. Camera identical to PK2350, but without screw for protectional sunshade on body. An only so far known camera has s/n #107531 (A.Zilbert coll. ).